I'm back! And who even knew I was gone? 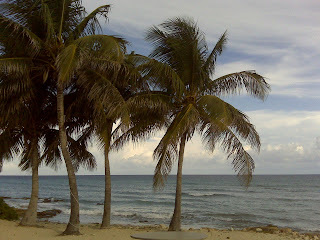 A sudden work trip had me running to catch a plane last week to a Caribbean island. I had to stay at the Ritz-Carlton. Poor me, right? Actually, it was almost zero fun, and deadly for the weight-loss plans. This was a wild-goose chase work trip (the person I was looking to interview never showed) and so I spent three fruitless days in a very nice but incredibly bland resort. It's one of those places that are gorgeous but completely devoid of character. I could have been anywhere in the world that has palm trees and blue skies. And huge buffet breakfasts, of course. Here's a picture from the grounds. It looks a bit fake, I think, but I swear it was real -- snapped with my cell phone. The sun had just dipped behind a cloud, hence the overcast light. 1) I did work out every morning. 2) I did not plan well, and got terribly hungry every afternoon when I didn't have time to eat lunch. 3) I compensated by eating a huge can of peanuts each day -- easily 1,000 cals a can. 4) I drank wine every night. 5) After a decent breakfast in the morning, I would overdo it on peanuts in the afternoon, and then have dinner late. A dinner I didn't need. 6) I did successfully avoid the pastry table every morning, and the dessert tray. That's about all I can say that's positive. Going to get weighed today. Expect bad news. I don't know, I think you did pretty well, considering the circumstances! (And yes, I did miss you!) You got your exercise in, you didn't have sweets, you didn't have much time to plan--doesn't seem too bad. And yes, that photo looks totally fake, but how cool?! Sorry your interview didn't happen. Looking forward to the weigh-n. I agree with Beej, you did pretty well. Like Beej, I noticed you were gone. It's too bad the trip was unproductive though. I am fortunate in that most of my trips are well planned out in advance. Spur of the moment trips really can throw a wrench in the fan. Yep, I check in most days so I notice when you're slacking on the posts missy! Caribbean resorts are no excuse, frankly! I think there's some good stuff in there though, and I always think anything other than an 'all or nothing' approach is more healthy. Once I slip I turn into Pac(wo)man and eat everything in my path.